Let’s look at some of its sights. 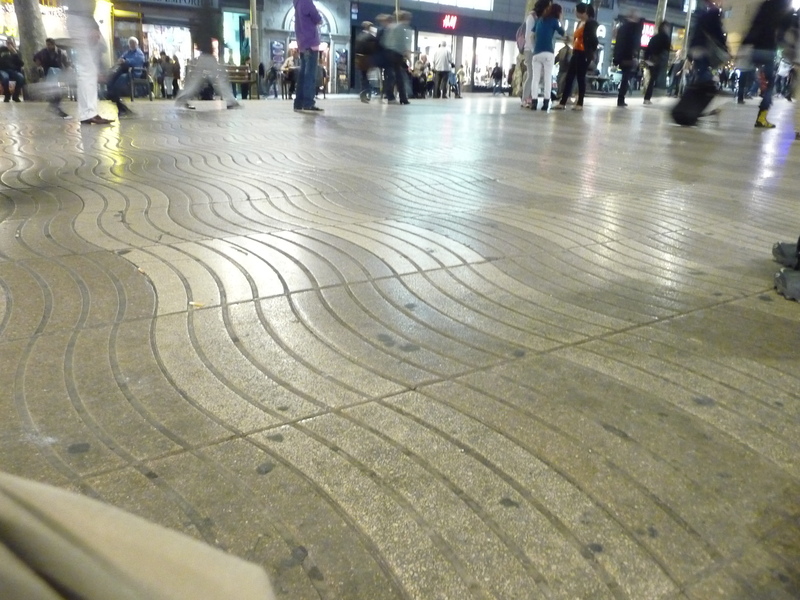 Originally outside the city walls and serving as a drainage ditch to carry wastewater down to the sea, the busy pedestrian- and vehicular-trafficked walkway/roadway known as La Rambla is a spectacle that draws tourists and lifelong Barcelona residents alike to stroll and shop along it. The difference is that the residents are talking, while the tourists are gawking and taking photographs. And why not? There’s so much to see and do along this three-quarter mile stretch of bricks and wavy lines in the concrete where cars and trucks occupy the outer lanes and pedestrians meander down the middle. 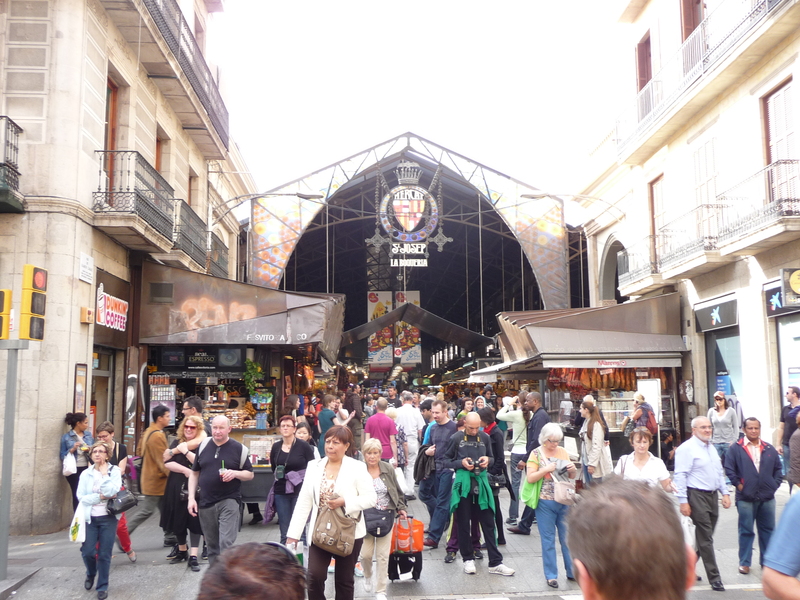 La Rambla is technically composed of five smaller streets, which is why some people refer to it as Las Ramblas. No matter what you call it, people will understand what you mean, and your enjoyment of it will be the same. 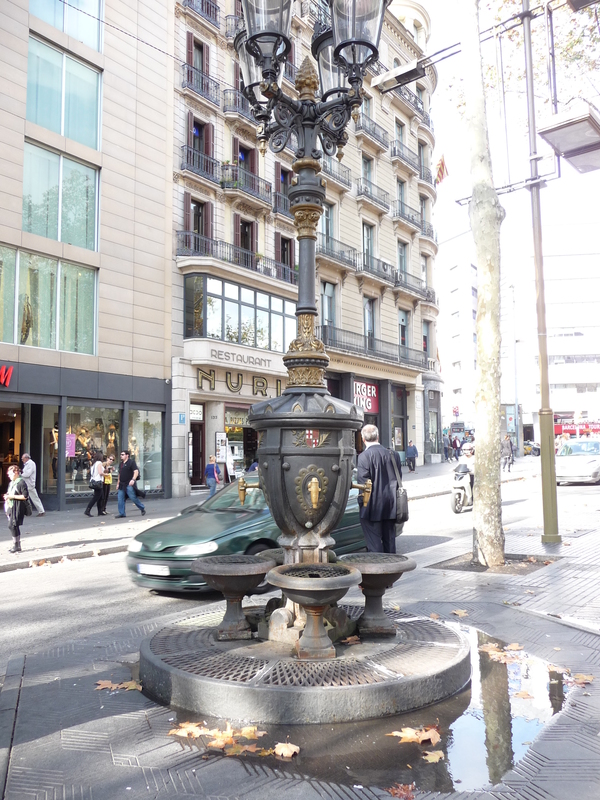 The famous Fountain of Canaletes pictured on the left is a free public water fountain topped by four glowing gas lamps. Legend says that when you drink from the fountain, you are certain to return to Barcelona one day. Unlike Trevi Fountain in Roma where you have to toss a coin into the fountain to be assured of returning to Rome, there is no monetary requirement here in Barcelona; just drink some of the cool, refreshing water knowing that you’ll be back someday. I took my drink from the fountain; now I’m just waiting to find out when I’ll be returning to Barcelona. The fountain is near the top of the walkway (it heads down to the Mediterranean Sea) just off the city’s main central square, Plaça de Catalunya. 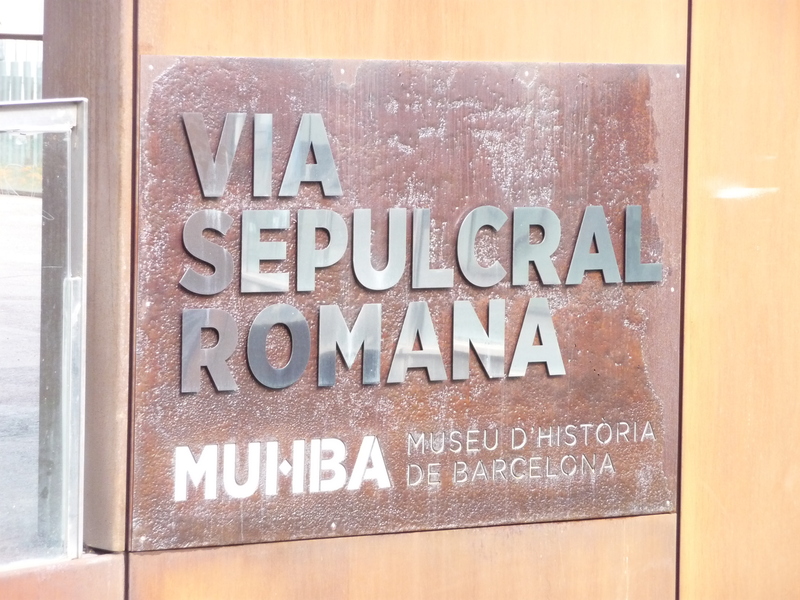 Who knew that there would be Roman ruins in Barcelona? An apartment builder certainly didn’t know it when he started excavating an area of land about one hundred yards east of La Rambla behind the Citadines Hotel. 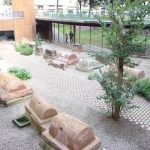 What could have been lost to antiquity was preserved thanks to some quick-thinking nearby apartment residents who noticed the graves that were being dug up. A couple calls to the authorities, and the excavation was halted. 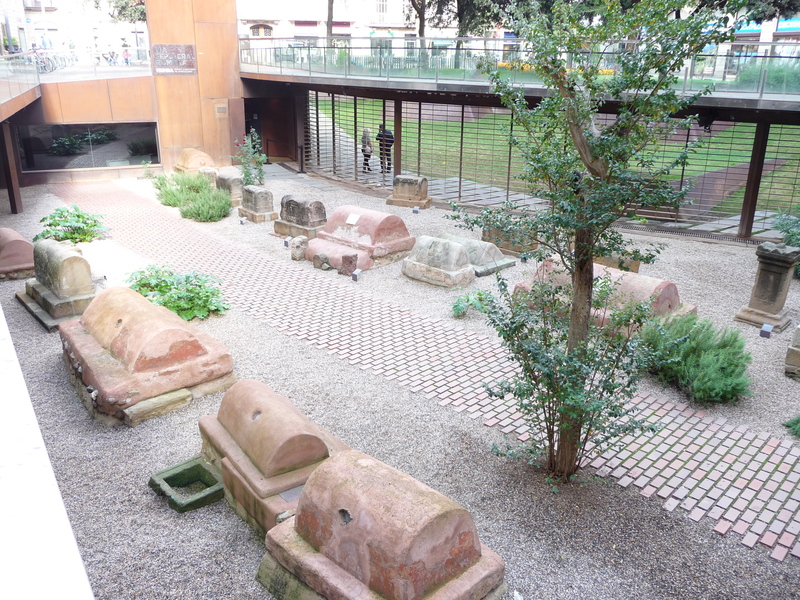 The neatly displayed ruins are at a below-ground level to illustrate the buildup of land that has occurred over the centuries since the Roman era. The neatly [re-arranged] outside tombs are complemented with excellent stories and timelines inside the visitors’ center. 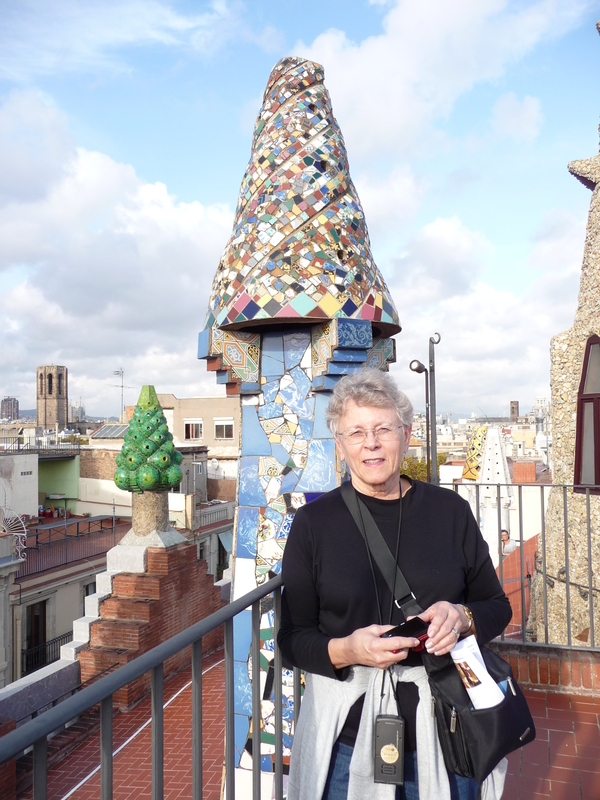 Are you receiving my monthly newsletter all about books and travel? 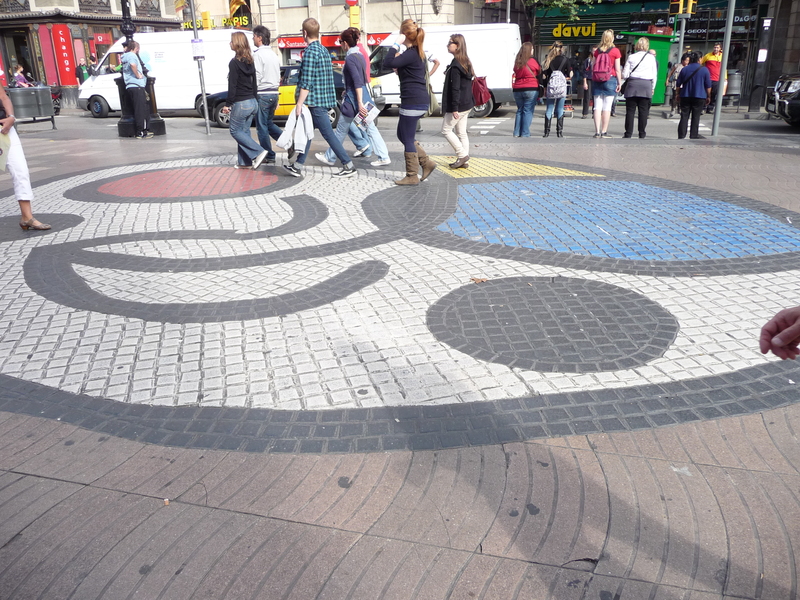 Back out on La Rambla is a piece of art by one of the most famous abstract artists, Joan Miró, who was actually born not far from here. 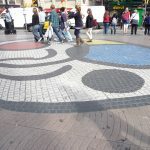 The circular mosaic resembles the shape of the cosmos, and the basic colors of red, blue, and yellow on black and white are meant to represent the innocence of children. It is difficult to get a photograph of the popular piece of art (popular to tourists; residents have seen it thousands of times) without anyone in it. In a way, that is part of what Miró had in mind — accessibility for everyone. Because the mosaic is part of a walkway, the colors do fade, the bricks do wear, and the mosaic has been updated so its beauty and meaning will continue to be imparted to all whose paths cross over it. The mosaic’s original placement had been near the gate [which has since been removed] of La Boquería, the amazing open-air market about fifty yards back up the hill. Let’s go there now. 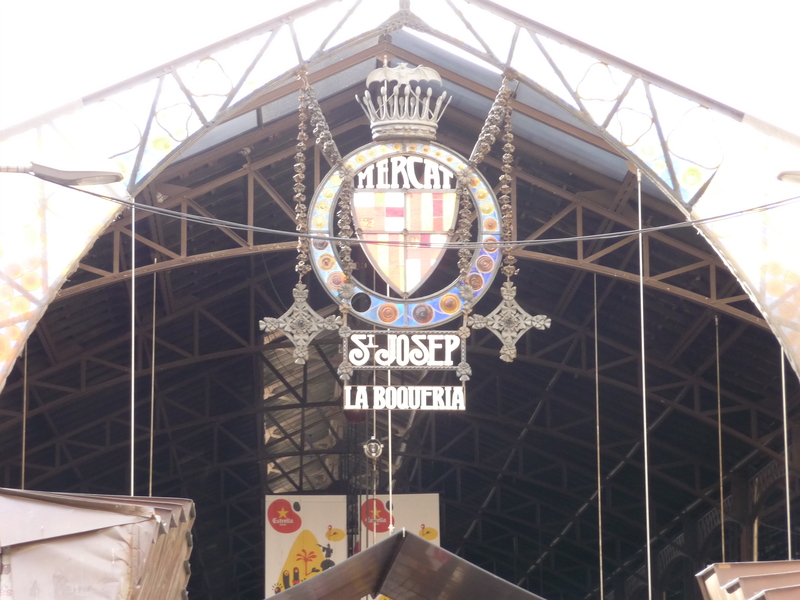 Over 800 years old, La Boquería is the pre-eminent open-air market frequented by Barcelonans of stature and by those who just want good food. 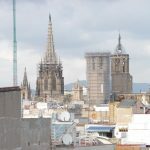 Like La Rambla was, La Boquería also was originally outside the city walls. 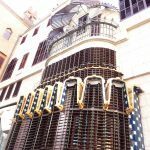 This was the custom centuries ago as the residents didn’t want to have fresh meats (that could go bad) inside the walls where they lived. That, of course, is the opposite today where locals want the convenience of being able to buy their fresh meats and produce while out for a stroll. With over 180 stalls, stands, and bars, La Boquería has the area’s widest assortment of meats, poultry, vegetables, nuts, flowers, seafood, and drinks. You could spend several hours just wandering up and down each aisle; and then you’d be ready to sit and have a refreshing beverage at one of the many sit-down stands. 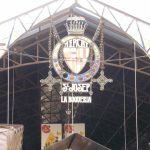 The online interactive map (boqueria.barcelona/home) is a good guide for getting you started; the rest of your journey there is on your own. But if you walk out hungry, that’s completely your own fault! 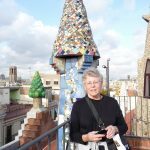 Even though there are many great ways to end your “La Rambla day,” spending a few hours inside a “palace” designed by Spanish architect Antoni Gaudí is hard to top. 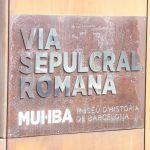 Near the bottom of the hill is a rather non-descript street, Nou Rambla, that wouldn’t be in travel guides if it weren’t for Palau Güell, a palatial residence designed by Gaudí. 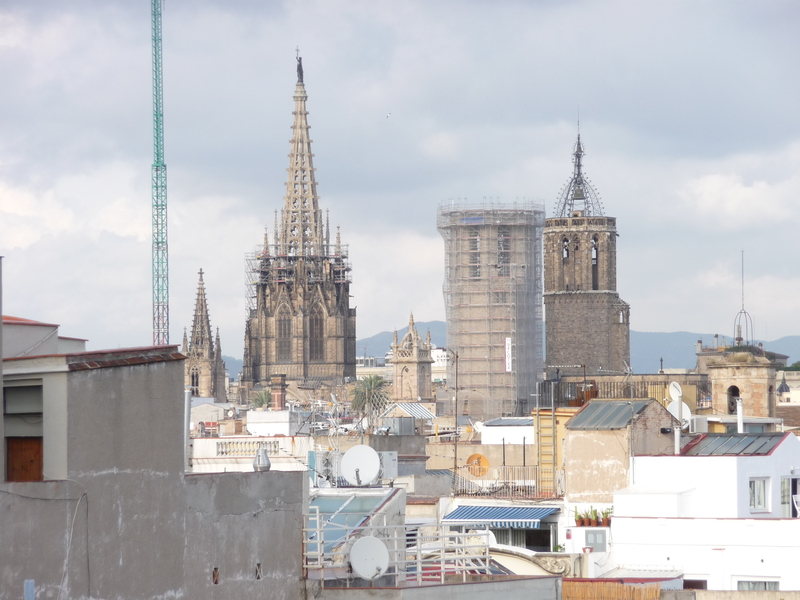 On the left, we are at the top of mansion as we look at toward his most famous work, the yet-to-be completed Sagrada Familia. 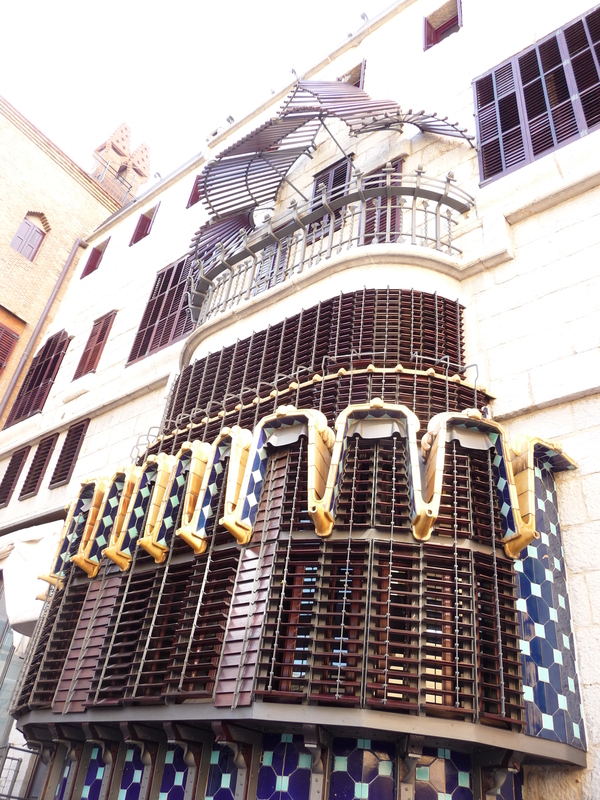 On the right is some of the ornate work on the outside patio. Not readily marked, the way to the roof rewards the adventurous not only with amazing views of the city, but you also see eleven chimney tops ordained in pieces of glass and ceramic. 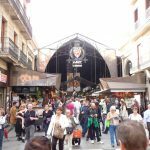 Your day on La Rambla is coming to a close, and you know there are still many more sights to see and alley ways to wander down. 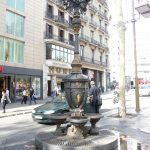 As you select an outside café to sit, have a warm or cold beverage while you reflect on your time along La Rambla, you’re glad that you took that drink from the Fountain of Canaletes so that you’ll be returning to Barcelona someday. When is that “someday” going to be? For me, I’m hoping that it will be a cruise that starts in Barcelona and heads south through the Atlantic Ocean.